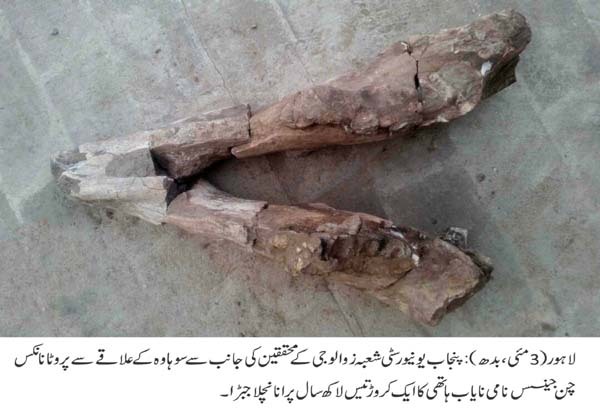 LAHORE: (Wednesday, May 3, 2017): A team of researchers of Punjab University Department of Zoology has discovered 13 million years old lower jaws of elephant from Chabbar Syeddan, Sohawa area in Punjab. The team consisted of former chairman of Department of Zoology Prof Dr Muhammad Akhtar, Dr Muhammad Akbar Khan, Dr Abdul Majid Khan, PhD students Ghayour Abbas, Muhammad Khalil Nawaz and other PhD scholars. 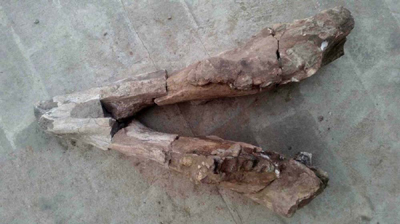 In a press statement, Dr Muhammad Akhtar said that the lower jaws belonged to Protanancus Chinjiensis species of elephant and its family was called Gomphotheriidae. He said that this species belonged to ancestors of elephant and was found only in that area and was named after the locality. He said that right and left heavily worn teeth, called molar 3, of the fossil were preserved. He said that the length of the mandibles was 700mm both sides and the estimated length of both teeth, molar 3, was 171mm. He said that its lower jaws was shovel shaped which was naturally good for digging the earth. He said that symphysis was also very long in the present fossil.